One of the joys of summer is taking road trips, right? One of the headaches of summer is hitting I-75 in full construction mode. “Construction for Next 50 Miles.” Oh, joy! What would make you stop? SCHOOL ZONE. YIELD TO PEDESTRIANS. This past weekend, I headed “up north” to the Henry Ford Museum for Maker Faire Detroit. It was a blast seeing technology and creativity go hand-in-hand. So, I guess my brain was all fired up as I cruised past construction sign after construction sign. “Do not follow GPS, follow signs.” Follow signs. Can we use temporary signs to re-educate drivers in Bluffton about crosswalks? I’ve been racking my brain on how to connect with drivers. The village is working on permanent sign improvements for the intersection of College and Main, and is printing brochures and coloring books. Still, I’m worried about getting drivers to change their habits. The big orange diamonds saying “Be Prepared to Stop” and digital messages alerting me to the number of traffic fatalities really caught my attention. Could they do the same with drivers on Main Street? In my experience, drivers aren’t scanning the area for pedestrians. I’m invisible! So I’ve started collecting signs and imagining what sign style and text would make you look and persuade you to stop for pedestrians. 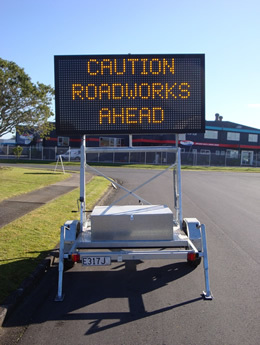 Roll-up signs: These bright orange diamonds can be customized and are lighter weight than metal signs. They could be rolled out in the fall and spring for ongoing driver re-education. Barricade or barrel signs: What do we have on hand? Perhaps barricades or barrels could be used to display signs and make the driver pay closer attention to the intersection (and their speed). 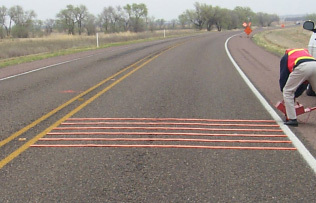 Rumble strips: To wake up distracted drivers, temporary rumble strips could be applied. Okay, am I getting a little carried away? I have spoken with Representative Bob Cupp about meeting with an ODOT representative here in Bluffton to insure that all of our options are being investigated. There is a lot we can do to improve conditions for pedestrians. A little creativity can make it safer to cross the road there. Or, perhaps, we can find a way to reinstate the signal that once made this intersection safer for pedestrians and drivers. I hate to say it, but the start of the school year is not that far away. Please join in the effort to make Bluffton safer for pedestrians. What can you do to help? 1) Stop for pedestrians! 2) Let your voice be heard. Talk or write to our educators, village employees, and elected officials about the need for improved pedestrian safety. Some folks need to be persuaded that there is a problem and they need to know that Bluffton residents are serious about pedestrian rights and safety.